Development of corporate bond market in India remains crucial for meeting the financing requirement of industry and infrastructure sector. Despite various initiatives undertaken in the past, there is little change in the overall market microstructure of the corporate bond market in India. At this backdrop, this article explores the available statistics on corporate bond market in India during recent times (2010-18) to analyse the various demand and supply side factors, which impede the growth of corporate bond market in India. It is found that the gradual increase in proportion of market-based sources in total debt financing by non-financial companies is confined only to the larger-sized firms. Though finance and infrastructure companies dominate the corporate bond market, mutual funds are playing an important role in diversifying the issuance base of the market. Empirical analysis suggests significantly higher risk-premia associated with lower-rated bonds in the private placement market. Development of a vibrant market for long-term debt is crucial for meeting the financing requirements of private business, and especially so in the context of the physical infrastructure needs of a rapidly modernising economy. 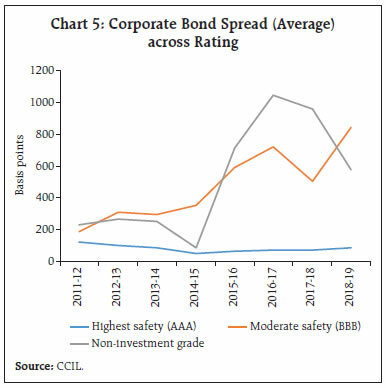 However, despite various initiatives taken in the past1, the growth of the corporate bond market in India still remains far from satisfactory. Corporate debt to GDP ratio in India stood at a meagre 17 per cent in June 2017 as compared to 123 per cent in the US and 19 per cent in the case of China (Table 1). This reflects a complex interplay of a host of demand and supply side factors overtime. First, investors’ base is narrow. The demand for corporate bond as an investment is mostly confined to institutional investors with retail investors accounting for only 3 per cent of the outstanding issuances. Even among institutional investors including the buy and hold category, demand for corporate bonds is constrained by prudential norms for investment for the insurance companies and mutual funds2. During 2016-17, the Central and State Government securities constituted almost half of the total investment of the life insurance companies and 36 per cent of the investment by the general, health and re-insurance companies. In contrast, investment in other securities constituted less than 5 per cent of total investment of these companies (IRDAI, 2016-17). Foreign investors, who could have played a critical role in broadening and deepening the corporate debt market in India were constrained by investment limits. In recent years, however, the investment limit for FPIs in the corporate bond has been enhanced along with a reduction in the withholding tax though FIIs are not fully utilising the enhanced limits due to limited liquidity in the market. Finally, banks prefer loans to bonds, as loans can be carried to their balance sheets without being marked to market (CFSR, 2008). On the supply side, the high cost of borrowing via debt instruments vis-à-vis other forms of raising finances and inadequate liquidity in the corporate debt market deter firms from market issuances. The large corporates can raise debt from the overseas markets, the cost of which, even after adjusting for hedging cost, tends to be lower than the cost of borrowing through the domestic market-based sources (Singh, 2007). Other key operational impediments include small outstanding stock of individual issuances inhibiting secondary market trading, non-availability of functional trading platform with central counter party (CCP) facility, illiquid market for credit default swaps (CDS), and non-uniform stamp duties on corporate bonds across various States. Against this backdrop, this article attempts to redress the imbalance in the literature in the form of relative neglect of the corporate debt market in an analytically meaningful manner. Notwithstanding challenges in data, the article attempts to provide a holistic view of the corporate debt market in India by examining the financing pattern of non-financial firms in India and by consolidating the non-standardised available data on corporate bonds issuance. The rest of the article is divided into six sections. Section II presents a cross-country comparative assessment of corporate debt markets with a view to draw lessons from country experiences. Section III analyses various sources of debt of non-financial firms in India. Section IV provides a brief description of the nature of issuance of corporate debt in India and also looks into the role of mutual funds in diversifying the issuer base in recent years. Section V addresses the basic features of the private placement market for corporate debt in India with an attempt to empirically pin down the factors that determine the risk-premia and coupons on various categories of corporate bonds in it. Section VI ends the article with some concluding observations. Most emerging market economies (EMEs), especially in Asia, have bank-dominated financial system with Government-owned development finance institutions channelising resources to specific sectors of the economy in consonance with the overall industrial policy and developmental agenda. Specific examples include the Brazilian Development Bank (BNDES) in Brazil, Japan Development Bank in Japan, and the Korea Development Bank in South Korea which played crucial roles in post war reconstruction and development of state-sponsored industries. Till the 1990s, the bank-dominated financial system remained the cornerstone of export-oriented industrialisation in East Asia. It was the East Asian crisis of 1997-98 that brought forward the urgent need to develop financial markets to cater long term financing needs of an ebullient and dynamic corporate sector. With the banking sector severely hit by the asset-liability mismatches and high foreign debt, excessive dependence on the banking sector gave way to the development of a well-diversified debt market, specifically for corporate bonds, to supplement the availability of bank finance. The Asian financial crisis brought into forefront the fact that bond market and banks need not compete with each other, rather they could be supplementing each other in serving the financing needs of large and small firms (Gyntelberg, et al., 2006). In India, development banks were gradually converted into universal banks, based on the recommendations of the Report of the Working Group on the Development Financial Institutions (DFIs) (RBI 2004). In this milieu, developing the corporate bond market assumes crucial importance for India, especially in the context of channeling funding to long term infrastructure, the requirement of which has been estimated at around US$ 4.5 trillion with cumulative infrastructure investment gap of US $ 526 billion till 2040 (Economic Survey 2017-18). Currently the corporate debt to GDP ratio in India is significantly lower than some developing countries such as Malaysia, South Korea, Brazil and Turkey (Table 1). Further, the total volume of trade in the secondary market for corporate debt has increased at a modest pace, with the monthly total traded value of corporate bonds standing at ₹1,210 billion in October 2018. *: Data pertains to 2014; **: Data pertains to 2015. Sources: Crisil-Assocham Report (January 2018) and IMF Private Debt Database. The relatively less developed market for corporate debt in India is also reflected in the nature of financing of India’s non-financial firms relative to other countries. In India, the proportion of firms using banks as the primary source of working capital is higher than most developing countries (Table 2). Further, the proportion of loans requiring collaterals as well as the value of collateral (as proportion of loan) are among the highest in India. This indicates the prevalence of asset-backed lending in India, which is essentially a feature of a relatively less developed financial system with limited expertise to gauge the credit risk of unsecured lending (Banerji, et al., 2012). Source: Enterprise Survey, World Bank. An analysis of the debt portfolios of non-financial firms in India provides insights into sources of debt and its composition as it has evolved over time. Over the last decade, there has been a gradual increase in the proportion of debt raised through market-based sources like bonds, debentures and commercial paper (CPs), though banks accounted for close to 45 per cent of total debt of these firms (Chart 1). Further, almost 75 per cent of the total bank borrowings in the recent years was secured. The share of other non-bank non-market based sources of debt, such as loans from promoters and inter-corporate loans moved in the range of 2-4 per cent, while foreign currency borrowings accounted for 14 per cent of total debt. Preliminary analysis of the sources of debt across various size-categories among non-financial firms (represented by deciles where decile 1 consists of the largest companies and decile 9 comprises the smallest ones) reveals that the preference for market based debt is confined to the larger non-financial firms. The share of market-based sources in total debt was less than 6 per cent for the size categories 3-9 and only for the largest two size categories, i.e., 1-2, the share of market-based sources was around 27-28 per cent (Table 3). For the smaller-sized firms, many of which may lack credit rating and the economies of scale enjoyed by the larger firms in the private placement market, banks remain the primary source of debt funding. Data on issuances of corporate bonds corroborate these observations. In addition, the composition of debt varied significantly across entity types and various age categories. During 2017, the share of market-based sources in total debt was higher for public companies (22 per cent) than private (10 per cent). Market-based sources accounted for a smaller proportion of total debt of firms that came into operation after 1991 (Table 4). This indicates that the corporate debt market is mostly accessed by relatively larger and established firms. *: Size is defined in the Prowess database as the three-year average of the total income and total assets of a company. Decile 1 consists of largest among the sample. Source: Author’s calculation based on data obtained from Prowess, CMIE. In the case of financial companies, the proportion of debt raised through debentures and bonds stood at around 28-30 per cent of their total debt. However, like non-financial companies, the higher proportion of debentures and bonds in total debt financing is confined to larger-sized financial companies (Chart 2). The growth of the private corporate sector’s resource mobilisation through the debt market has largely tracked growth of bank credit to industry. This is possibly due to the fact that more than 80 per cent of the total credit issued by banks to the industrial sector are to large firms, which also raise resources from the debt market (Chart 3). The total resource mobilisation by Indian corporates through public/private/rights issues is dominated by debt while equity accounts for close to 38 per cent. The most notable feature of the debt market is that bulk of the debt (close to 99 per cent) is placed privately, which has not changed despite various measures taken by the regulators in the past. Sector-wise breakup of issuances in the primary market for corporate debt shows the dominance of finance and infrastructure companies, which together accounted for 90-92 per of total cumulative value outstanding during 2017-19. The share of manufacturing was less than 1 per cent. In the primary market, the bulk of bonds issued were 2-5 year tenor range (56 per cent). The highest rated bonds (AAA rated) accounted for more than half of total amount outstanding in the primary segment during the last two years (Table 5). The secondary market exhibits a similar sector-wise and rating-wise composition with finance and infrastructure companies together constituting around 80 per cent of the total traded value (Chart 4). Similarly, the highest rated bonds accounted for close to 80 per cent of the total secondary market trading (Table 6). The higher concentration of high-rated bonds in the corporate debt market could be attributed to low market bandwidth and limited investors’ appetite for bonds with high risk-return combinations. It is also observed that high-rated bonds have significantly lower spread vis-à-vis non-investment grade bonds (Chart 5). In the primary market, the top 5 issuances in terms of value accounted for 53 per cent of the total value of issuances in November 2018. The high concentration is also reflected in the secondary market with top 25 traded bonds accounting for roughly one-third of total traded volume (Table 7). The mutual funds (MF) industry has played an important role in the development of corporate bond market in India by catalysing innovation, price discovery, liquidity and transparent bond valuation. Further, MFs have also played a crucial role in promoting secondary market trading of corporate bond since all other categories of investors generally hold the bonds till maturity. Assets under management (AUM) of short-term debt funds, which are the largest investors in the corporate debt segment, have increased at a rapid pace with corporate bonds and CPs accounting for close to 77 per cent of total funds deployed (Chart 6). Investment in government securities (G-secs) accounted for only 6 per cent of their total funds by contrast. Sector-wise, bonds issued by real estate, NBFCs and PSUs constitute about 1 per cent, 19 per cent and 23 per cent, respectively, of the total investment in corporate bonds by the debt MFs. Interestingly, the “other”3 category accounts for close to 57 per cent, indicating the important role being played by the MFs in creating demand for bonds with high risk-return combination (Chart 7). Note: For all other years, data pertain to March. Despite the predominance of private placement in India’s corporate debt market, there has been little research on the functioning of this segment, mainly due to lack of detailed data. Intuitively, the predominance of private placements implies that all the characteristics of a well-developed market do not exist and prevailing conditions reflect an information-intensive relationship-lending market in which investors act like banks in collecting information pertaining to the borrower, which is not publicly available (James and Smith, 2000). However, the major difference between bank lending and private placement of debt is that in private placement market, insurance companies are the major players as they find investment in such markets attractive due to long-term and fixed nature of their liabilities. As a result, the nature of lending in terms of tenure and information asymmetry prevailing differs significantly from the bank loan market (Carey, et al., 1994). It is interesting to note that secured lending accounted for close to half of the total amount raised even in the private placement market of corporate debt (Chart 8). The private placement market for corporate debt is dominated by private financial companies which account for 47 per cent of the total amount raised during the period 2015-16 to 2017-18. The average tenure of bonds is 4.8 years and is higher for public companies than their private counterparts. The coupon rates for the private companies were higher as compared to the public ones, implying differences in risk perception. The coupon rate is highest for private non-financial companies (Table 8). Source: Author’s calculation based on data obtained from BSE, NSE, merchant banks. A comprehensive analysis of how bonds are priced in the case of private placement is often hampered by non-availability of detailed and uniform data on privately placed corporate bonds. However, based on the available data, an attempt has been made to understand how the coupon rates in the private placement market is impacted by terms of the loan, security-specific factors as well as the general interest rate environment. More specifically, an attempt has been made to empirically understand whether the positive relationship between risk and return holds in the private placement market for corporate debt as well. Based on the available data, empirical analysis of the determinants of coupon rate in the private placement market warrants the consideration of two sets of key variables i) security specific characteristics such as riskiness of the security, sector (private/ public), nature of operation (financial/non-financial), tenor, and nature of lending (secured/unsecured); ii) macro-variables reflecting the general interest rate environment and spread of AAA rated corporate bonds over the benchmark 10 year G-sec rate as indicative of market perception of riskiness of corporate bonds. Ratings assigned by the rating agencies are taken as an indicator of the riskiness of the bonds. Often bonds are rated by more than one rating agency and the existing literature does not suggest any specific methodology to compare the ratings by various agencies. In the absence of a standardised procedure, this article adopts the following approach: bonds are classified into three classes according to their riskiness. Bonds with AAA rating by any agency are considered as the safest instrument in the market followed by all bonds which are rated less than AAA but still fall under the “A” category. The remaining bonds, i.e., bonds rated BBB or below or unrated are grouped as relatively risky. In cases a bond has been rated by more than one rating agency, the lowest of ratings is used. Over the period 2015-2018, the coupon rates of privately placed bonds are estimated as a function of the tenure of the bond, the nature of ownership (private/public), the area of operation (financial/nonfinancial), nature of lending (secured/unsecured), and the bond’s riskiness measured by the bond’s rating, as explained earlier. PUBLIC, FINANCIAL, SEC are three dummy variables intended to capture the nature of ownership, type of operation and category of lending. The variables AAA and C are dummy variables defined for the two classes AAA and the most risky bonds, respectively, while the remaining category is taken as the base. Variables used to capture the general interest rate environment and market perception about relative riskiness of the private bonds are the 10 year G-sec yield (GIND10) and the spread of the AAA rated corporate bond (10 years) (CORPAAA), respectively. Accordingly, the model specified below is estimated. The estimated coefficients have the expected signs (Table 9). The coupon rate of the privately placed bonds was found to be positively related with its tenure, indicating a higher risk-return combination for longer term-bonds. However, the estimation results suggest that the tenure of the bond is not a significant factor determining its coupon, which could be due to the pooling of data on bonds of various risk profiles. Similarly, secured lending is associated with a lower coupon rate, as expected. Further, the coupon rates largely tracked the 10 year G-sec yield prevailing on the day of the placement and the spread of the AAA rated corporate bonds over the 10 year G-sec. Note: Heteroscedasticity-consistent robust standard errors in parentheses; The variance inflation factors (VIF) for all variables were less than 10, indicating that multicollinearity problem was not severe. ***: p<0.01, **: p<0.05, *: p<0.1. The coefficients of both PUBLIC and FINANCIAL are negative and significant, implying a lower coupon rate if a bond is issued by either a public or a financial company, indicative of an implicit public guarantee in the case of the former. Both AAA and C dummies are significant indicating the riskiness of the bond is an important factor in determining its coupon rate. The structure of risk premia across various rating classes indicates significantly higher risk-premia on lower rated/unrated bonds. On an average, differences in the coupon rates between the AAA rated bonds and risky bonds (with rating BBB or below) was found to be 5.02 per cent in the empirical results. Finally, the two interaction dummies are found to be insignificant, which indicates that the relation between coupon and tenor of privately placed bonds does not vary significantly across ownership or nature of operation. To sum up, the results indicate that even in the private placement market, investors have significantly higher risk perception about low-rated bonds. This possibly explains the reason for predominance of AAA rated bonds in India’s corporate debt market. The overall market microstructure of the corporate debt market in India is yet to evolve in terms of enabling vibrancy and depth. Both the primary and the secondary segments of the market continue to be dominated by issuance of bonds by infrastructure and financial services companies while the share of manufacturing firms is negligible. The placement of corporate debt remains largely private, accounting for as high as 98 per cent of the total amount raised, on an average. Coupon rates on various categories of bonds in the private placement market are influenced by several factors such as tenor, ratings, type of issuance, movements in the 10 year G-sec yield, and the overall market perception of riskiness. Several policy measures can be considered to enhance the bandwidth of the market. Apart from rationalising the stamp duty on corporate bonds across States, development of a liquid market for CDS and steps to incentivise public issuance/listing warrant priority. Additionally, the investor base in the corporate bond market remains narrow due to high risk perceptions. In this context, the role of credit rating agencies (CRAs) in disseminating information on the issuers of corporate bonds remains critical. Credit rating agencies also help in identifying the presence of junk bonds in the market. The enactment of the Insolvency and Bankruptcy Code (IBC), 2016, which replaces all the other resolution frameworks introduced earlier, is expected to strengthen investors’ confidence in the corporate bond market. The 2016-17 Union Budget announcement of setting up of Credit Enhancement Fund could leverage the access of the infrastructure companies into the corporate bond market, complemented by the large exposure framework laid down by the Reserve Bank. Going forward, the development of quasi-bond products and operationalisation of the 2018-19 Budget announcement mandating large corporates to raise 25 per cent of their funding need from the bond market could go a long way towards developing a vibrant and liquid corporate bond market in India. Carey, M.; Prowse, S.; Rea, J.; Udell, G. (1994), “The economics of the private placement market”, Federal Reserve Bulletin 80(1), 5-6. Gyntelberg, J., Ma, G., and Remolona, E. (2006), “Developing corporate bond markets in Asia”. BIS Papers, 26, 13-21. James, C., & Smith, D. C. (2000), “Are banks still special? New evidence on their role in the corporate capital‐raising process”. Journal of Applied Corporate Finance, 13(1), 52-63. Patil, R. (2004), “Corporate Debt Market: New Beginnings”. Economic and Political Weekly, 39(12), 1237-1246. RBI (2004), “Report of the Working Group on Development Financial Institutions”, Available at https://www.rbi.org.in/Scripts/PublicationReportDetails.aspx?UrlPage=&ID=387. SEBI (2018), “Expanding India’s Corporate Bond Market: Bonds of Growth-Assessing the Supply Demand Matrix”. Speech by Shri Ajay Tyagi, Chairman, SEBI at CRISIL’s 5th Annual Seminar on October 24, 2018. SEBI Bulletin, November 2018. Singh, B. (2007), “Corporate choice for overseas borrowings: The Indian evidence”, RBI Occasional Paper, Volume 28, No 3, Winter 2007. * The article is prepared by Shromona Ganguly, Research Officer, Division of Financial Markets, DEPR. The views expressed in this study are personal and do not represent the views of the Bank. 1 The various initiatives undertaken by SEBI for expansion of corporate bond market include, inter alia, information repositories developed by exchanges and depositories for providing consolidated statistics, electronic book building mechanism for increasing transparency in the private placement market, tri-party repo trading on exchanges for facilitating liquidity and price discovery in the market, improving liquidity in secondary market trading through consolidation and re-issuances by the same borrower under the minimum number of International Securities Identification Numbers (ISINs) (Patil, 2004; SEBI, 2016, 2017, 2018, 2018a). 2 The prudential norms for investment for the insurance companies and pension funds stipulates a maximum of 25 per cent of the portfolio of these companies to be invested in bonds which are rated less than AA. 3 Bonds issued by companies in sectors other than Real estate and NBFCs.